In Finding Dory, the sequel to Pixar's 2003 underwater adventure, Pixar sets the tone early. An adorable young Dory, big-eyed and squishy cheeked, is seen with her parents struggling to remember a simple rhyme—even one, as we soon find out, that's designed to keep her safe. As Dory's parents, Jenny (Diane Keaton) and Charlie (Eugene Levy), sing the tune about not swimming in a nearby undertow, Dory wonders why she's not like everybody else. "What if I forget you?" Dory asks, completely terrified. "Will you forget me?" The ensuing look on her parents' faces, knowing poor Dory won't even remember what she just asked, is utterly heartbreaking. But Dory is fully aware she has a condition and understands (to an extent) the unfortunate limitations it places on her. She has to preface encounters with strangers about her memory loss, and the only way she can remember where she lives is to follow a line of shells like breadcrumbs. Her parents do the best they can to prepare her for the world, but they know the challenges will be great. It leaves them saddened and stricken with anxiety. 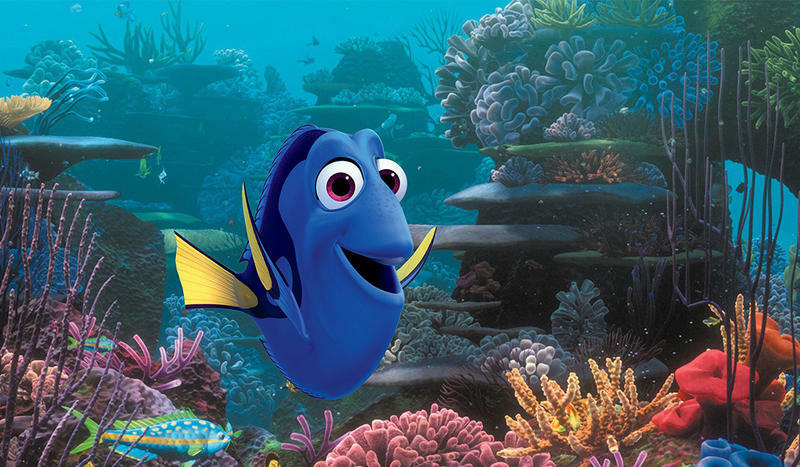 Finding Nemo largely treated Dory's condition as a punchline, and while her short-term memory is still used as a comedic tool in the sequel, Pixar acknowledges just how devastating her handicap can be. And not just for her, but her parents, too. Learning Dory's back story adds a huge emotional depth to the and poignantly explores how a disability, memory loss or otherwise, can profoundly affect the person afflicted with the condition and their loved ones. Any young child who feels like they aren't "normal" can look to Dory (Ellen DeGeneres) for inspiration, and understand that even if they might suffer from a disability, they're still capable of great things. Dory, for all her struggles, manages to survive after she's separated from her parents, until her fateful meeting with Marlin (Albert Brooks) in Finding Nemo. Fast forward a year later, and the three are happily cohabiting in a cute community filled with stingray, octopi, and more. This all sets up for the real movie, which kicks into high gear during a field trip in which Dory has a flashback about her family, whom she didn't even realize existed. "The Jewel of Morro Bay," she mutters following a jolt of forgotten memories, not really knowing what they mean. But she knows she has a family and knows she misses them, so Marlin and Nemo accompany her on a cross-ocean journey to Morro Bay, California, bringing them to a marine institute where she seemingly grew up. Of course, getting into a marine life institute if you're a fish is pretty much impossible. But, as if by some divine intervention, Dory is quickly escorted inside when nearby biologists find her entangled in plastic; she's then tagged for an aquarium exhibit located in Ohio. That's when an octopus named Hank (Ed O'Neil) comes in, along with a handful of other memorable characters. It's with these new cast members that Finding Dory really finds its stride. Again, Finding Nemo mostly used Dory's condition as tool for laughs; not in a cruel way, but in the kind of way you might give someone a hard time for forgetting what they ate earlier in the day. It's great to see that in Finding Dory, director Andrew Stanton capably avoids turning the blue tang fish into a sideshow, and rather into a character with a layered personality that evolves as the movies goes on. It's astonishing how much of Finding Dory actually takes place outside of the ocean. After Dory's memories hit, the movie wastes no time getting to the institute, which means we spend about 2/3's of the film showing Dory and Hank working together to find her parents. 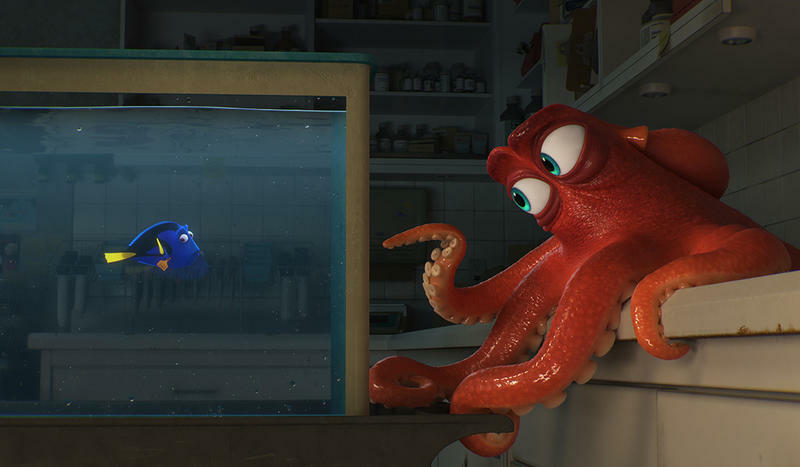 Hank doesn't initially take to Dory's shenanigans, but the curmudgeon eventually falls for the forgetful fish, who is contagiously positive in the best way. After one particularly scary moment—one that small children might find frightening—the two form a beautiful bond, creating an unlikely emotional connection the likes of which we haven't seen since Buzz and Woody. However, I found the best moments happened with the wacky cast of characters Marlin and Nemo encounter just outside of the institute walls, including a mangy bird named Becky and two languid seals played by Idris Elba and Dominic West, both of whom provide some of the movie's most laugh out loud lines. For as terrifying as Elba was as Shere Khan in Disney's The Jungle Book, his character in Finding Dory is lazy, unconcerned, and absolutely hilarious. These moments help lighten the more serious tone of Dory's adventure and show Pixar at its silliest. While it's a bit of a bummer the locale isn't quite as diverse as the first film, I have to commend Finding Dory for attempting to reinvent the formula into something you wouldn't expect. We already spent time with Marlin and Dory searching half-way across the world for little Nemo, and I was pleased to see the film didn't follow the same exact blueprints. Sure, the plot isn't that far removed from what we saw in Finding Nemo. But Finding Dory is a deserved sequel that never feels like Pixar is simply trying to cash in. And it nails most of the jokes, especially the unexpected use of Sigourney Weaver, who many of the characters believe is somehow a divine being. Because most of the movie does occur outside of the ocean, the scenarios are incredibly implausible, even for a movie about talking fish. It didn't bother me so much but I wonder if Pixar could have kept the scenarios a little more grounded. I mean, I can see a mangy bird carrying two clown fish in a bucket. But it starts to get a little too far fetched when Hank and Dory drive a big box truck. Kids, however, will eat it up. Finding Dory is a wonderful story and a worthy follow-up to the 2003 original. It's funny, heartfelt, and tackles a difficult subject in a moving way; it's also incredibly beautiful to look at, made even better by Dolby Atmos and Dolby Vision, which provides a clearer picture and better sound. I wouldn't say it's quite as good as Finding Nemo, but it shows that Pixar is capable of making a solid sequel that doesn't just feel like the studio is phoning it in. That bodes well because Pixar has several other big sequels on the way, including Toy Story 4, Cars 3, and The Incredibles 2.